Father’s Day is almost here! If you’re still looking for the best gift for Dad for Father’s Day in Destin, at Bay Breeze Patio, we’re here to help. Since coastal Dads love to spend time outdoors, they’re known for their prowess at the grill, Big Green Egg and smokers of all kinds. With that in mind, we’ve rounded up the hottest new grilling gadgets and tools for Dad. EGGcessories. 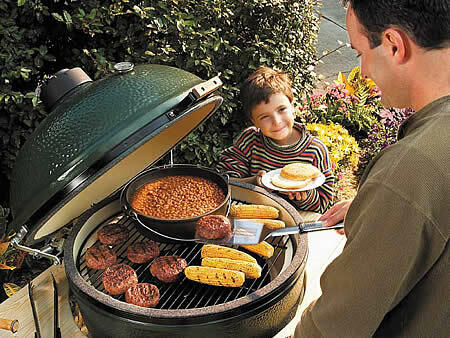 If your Dad loves to prepare foods on the Big Green Egg, Bay Breeze Patio features a diverse selection of Big Green EGGCessories, including pizza stones, cast iron grill grates, plancha griddles, and NEBO lighting. Smoke by Thermapen. Designed for competition BBQ teams and professional chefs, Smoke outlasts and outperforms every other product in this category. But what we really love aout Smoke is that is monitors both the meat and the pit AND you can bring the receiver inside and watch it there. Two channels (one for the meat and one for the pit) and wireless to 300-feet line of sight. Smoke features a rugged housing and splash proof protection along with a dashboard-style display that shows min/mix and hi/low alarms. Dad can hang out with friends and family without hoovering over a hot smoker and the whole will enjoy cooked to perfection meats. Flame Boss. While we love the name, we also love this digitally controlled fan via WiFi. The Flame Boss temperature controllers for charcoal grills and smokers make Dad a better pitmaster. He’ll smoke tender and moist meat the way nature intended it low and slow with the help of this temperature control. This product is great for dads with the Big Green Egg. In fact, we carry a wide variety of EGGcessories that will make Dad the “smokin’ hot”. We invite you stop by and see us at 32 Forest Shore Drive, Miramar Beach, and tell us about your Dad’s interests and we’re ready to help you find the perfect gift for Father’s Dayt. We’re open 7 days a week at 10 a.m. and open at noon on Sunday. We’re here to help Celebrate Dad!